As applied to skin, Derma+Flex® QS™ is syrup-like in viscosity and polymerizes quickly—usually in less than 60 seconds. It is a sterile, topical adhesive that contains a monomeric (2-octyl cyanoacrylate) formulation and the colorant D & C Violet #2 which allows the user to easily see where the adhesive has been applied. 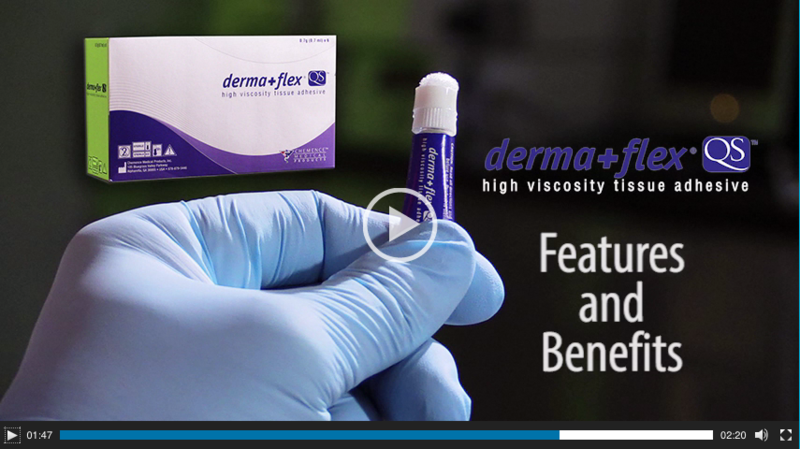 The increased viscosity of Derma+Flex® QS™ is formulated to reduce the risk of unintended placement of the adhesive during application due to migration of the liquid adhesive from the wound site. The Derma+Flex® QS™ new flat tip applicator is perfectly suited to ensure the adhesive makes good contact with the patient’s skin. It also creates a perfect seal that is smooth on the skin each and every time. To open Derma+Flex® QS™ High Viscosity Medical Tissue Adhesive, simply screw on the applicator tip just like screwing a nut on a bolt until finger tight. While holding applicator tip in one hand in an upright position, finish twisting tube in a clockwise motion until applicator is tight and seal is punctured (a purple dot will appear on applicator sponge). Derma+Flex® QS™ has no glass ampules to crush and squeeze, eliminating any chance of glass puncture to user. While holding upright and not facing downward toward the patient’s skin, begin squeezing tube from the bottom and continue to flatten tube moving all adhesive to the top of the tube until a steady flow of adhesive is expressed through applicator sponge tip. Look for the purple “snow cone.” Once the snow cone appears, stop squeezing the tube. Adhesive is now ready to be applied to skin. While holding the flattened part of the tube, begin “painting” the area of the skin that requires adhesive in a back and forth motion, covering the entire surface of the approximated skin edges as well as the area around the edges (forms a larger microbial and waterproof barrier as well as added closure strength). When the applicator sponge begins to turn white, turn the tube upright, and squeeze until the sponge is saturated with adhesive once again. Return to applying to patient without squeezing. When applied correctly,Derma+Flex® QS™ will polymerize (dry) in less than 60 seconds. Squeezing the tube while applying to skin will result in too much adhesive being applied to the area and very slow polymerization (dry) times. 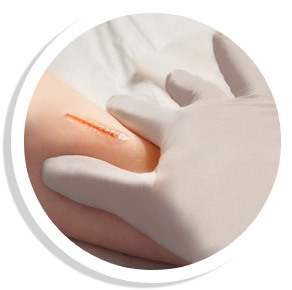 After Derma+Flex® QS™ has fully polymerized (dried), a bandage may be applied to the area – but is not necessary as the adhesive forms a microbial and waterproof barrier over the wound site.